Maxi: Morning. He waits patiently in the bath tub for some biscuits. The puppy cannot reach him here, in this safe shiny bowl. Maxi discovered the sanctuary of the bath tub on the first day we brought Coco home. At 5:00 AM every morning (if we're not already up), he gingerly walks along the head of our bed to gently wake us before wandering into the bathroom, where he sits like this in the bath tub, waiting patiently for our clumsy hands to fill his bowl with biscuits. The sound of the biscuits clinking into the dish will often wake Coco and she will bound into the bathroom, squinty-eyed under the bright lights in search of the delicious biscuits that do not make it onto her menu. It is in this bath tub that Maxi will sit at the small table and crunch away at his biscuits, before silently making his way back to our bed, where he sleeps curled up near our feet until the first light breaks. I can always rely on Maxi for these morning cuddles. 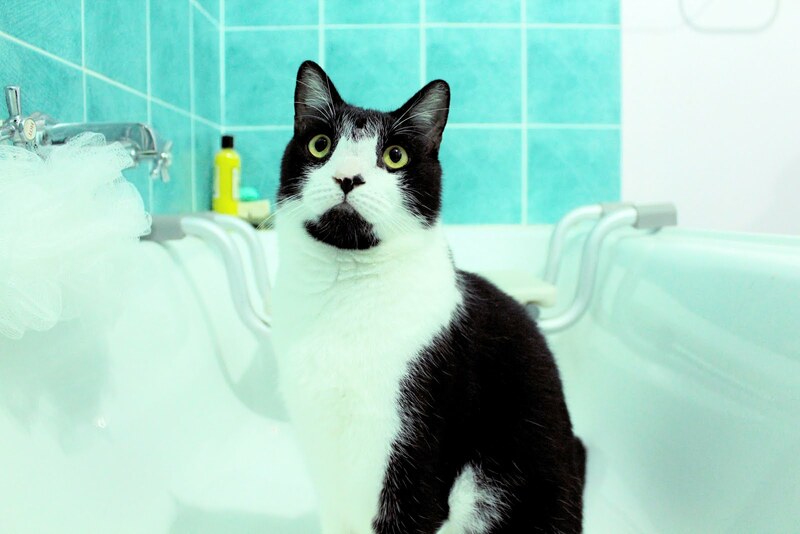 Love this picture and love that he waits in the bathtub for his biscuits, so cute! I think so too, Jennifer. He's rather cute in the mornings. That's why I don't get grumpy when he wakes me so early. How could I be grumpy with this little face? Beautiful...he seems to be inquisitive!! !